The term whistleblower derives from the practice of English bobbies, who would blow their whistles when they noticed the commission of a crime. The whistle would alert both law enforcement officers and the general public of danger. Most whistleblower's are internal paranormal group whistleblower's, who report misconduct to a fellow investigator or established ones within our community. I wish I had a nickel for all the people who have come to me telling me secrets of false paranormal investigations that some of our out front greats put forth. Why do they do it? For the truth or personal games? To destroy someone's creditability in the field, or to pump up their own standings. But personally I believe we need tois ying and yang in all areas of the world. Those who believe and those that do not, that's what makes the world go round. Right !?! So you want to become famous or infamous in the paranormal community? Becoming a debunker is easy. 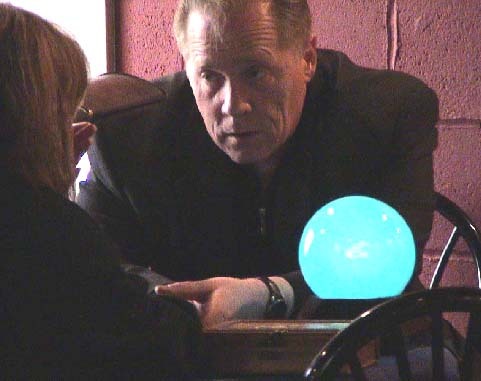 Easier then becoming well known in the paranormal haunted business field as a legitimate person. It always seems to bring either respect or ridicule to either parties but it certainly shifts the haunted spotlight from one to the other. Harry Houdini was a spiritualist or paranormal whistleblower, so are today well known magicians James Randi and Penn Fraser Jillette & Raymond Joseph Teller. They try to expose those fraudulent in the field of the strange weird and debunk the paranormal claims of those that fall under their ever watchful eye. Whistle blowing in the opinion of some is just what the doctor ordered to clear out the unscrupulous Investigators groups and paranormal writers that have mislead the public. But the eye of the public is often blind. Unless you can make a name for yourself. In the 1920s, after the death of his beloved mother, Cecilia, he turned his energies toward debunking self-proclaimed psychics and mediums, a pursuit that would inspire and be followed by later-day conjurers Milbourne Christopher, James Randi, Martin Gardner, P.C. Sorcar, Criss Angel, and Penn and Teller. Houdini's magical training allowed him to expose frauds who had successfully fooled many scientists and academics. He was a member of a Scientific American committee which offered a cash prize to any medium who could successfully demonstrate supernatural abilities. Thanks to the contributions and skepticism of Houdini and four other committee members, the prize was never collected. As his fame as a "ghostbuster" grew, Houdini took to attending séances in disguise, accompanied by a reporter and police officer. Possibly the most famous medium whom he debunked was the Boston medium Mina Crandon, also known as "Margery". Houdini chronicled his debunking exploits in his book, A Magician Among the Spirits. But yet Houdini still be lived in real ghosts and the afterlife. These activities cost Houdini the friendship of Sir Arthur Conan Doyle, the creator of Sherlock Holmes. Conan Doyle, a firm believer in Spiritualism during his later years, refused to believe any of Houdini's exposés. Conan Doyle actually came to believe that Houdini was a powerful spiritualist medium, had performed many of his stunts by means of paranormal abilities and was using these abilities to block those of other mediums that he was 'debunking' (see Conan Doyle's The Edge of The Unknown, published in 1931, after Houdini's death). This disagreement led to the two men becoming public antagonists. Gabriel Brownstein has written a fictionalized account of the meetings of Houdini, Conan Doyle, and "Margery" in The Man from Beyond: A Novel (2005). Houdini died of peritonitis resulting from appendicitis in Detroit, Michigan, at Grace Hospital in room 401 at 1:26 P.M. on October 31, 1926, Halloween. He is buried at Machpelah Cemetery, 82-30 Cypress Hills Street, Queens, New York. His entire family is buried there, mother, father, sister and brothers - but not his wife Bess. A plot next to Harry was planned for her, but she couldn't be laid to rest there, because Machpelah is a Jewish cemetery, and Bess was Catholic. Bess Houdini died on a train in California enroute to NYC, and is buried at the Gate of Heaven Cemetery, Stevens and Bradhurst Avenues, Hawthorne, New York. The 2006 book The Secret Life of Houdini by Kalush and Sloman has an account of Conan Doyle's involvement with the camp of "Margery" and presents personal letters showing that Conan Doyle and Mina's husband strongly believed that revenging spirits (not persons) would soon kill Houdini for hiding the "truth". The book further proposes Conan Doyle's campaign to hijack Houdini's legacy when a Spiritualist minister friend of Conan Doyle, Rev. Arthur Ford , conspired with him to bring messages from Houdini and his mother back from the grave in séances, including one on the roof of the Knickerbocker Hotel, which would further the Spiritualists' agenda. According to the book, Houdini's wife felt so depressed that she actually tried to commit suicide on the eve of the séance. There is no mention of the fact that, twelve days after the séance, Bess Houdini wrote a moving letter to Walter Winchell, the columnist, which was published in the Graphic, denying the words she received from her deceased husband were given to Ford by herself, denying the charge Bess and Ford had conspired together to perform a publicity stunt to further their careers in the entertainment industry. She trusted Ford's reading. Neither is there any mention of the fact that the Houdini code was already widely known by the public months before the séance. At the séance, Ford claimed to have contacted both Houdini and his deceased mother via Ford's spirit guide "Fletcher", and stated that the message received was in the pre-arranged code worked out by Houdini and Bess before Houdini's death. A brief letter supposedly signed by Bess Houdini appeared, which read in full: "Regardless of any statements made to the contrary, I wish to declare that the message, in its entirety, and in the agreed upon sequence, given to me by Arthur Ford, is the correct message pre-arranged between Mr. Houdini and myself." On January 10, 1929, New York Graphic reporter Rea Jaure filed a story entitled "Houdini Message a Big Hoax!" stating that Ford had confessed in an interview to having paid Bess Houdini for her cooperation, but Ford later claimed the interviewee was an imposter. Further muddying the waters were Bess Houdini's conflicting statements about the success of Ford's experiments; she is alleged to have written an impassioned letter to the famed columnist Walter Winchell initially defending Ford, and a New York Times article from January 15, 1929 has her responding to rumors that the code had been "leaked" in advance by stating that, "No one but her husband and herself could possibly have known the details of the code. Neither overtly nor covertly could it have been gleaned... To this argument she clung." But by March 18,1930, both the New York Times and Bess Houdini had modifed their stance. "Numerous attempts to convince Mrs. Houdini that her husband is communicating through a medium were made," the Times said, "but she steadfastly denied that any of the mediums presented the clue by which she was to recognize a legitimate message." On March 22, 2007, around 80 years after Houdini died, his grandnephew (on his wife's side) George Hardeen announced that the courts would be asked to allow exhumation of Houdini's body. The purpose was to look for evidence that Houdini was poisoned by Spiritualists, as suggested in The Secret Life of Houdini. In a statement given to the Houdini Museum in Scranton, the family opposed the application and suggested it was a publicity ploy for the book. External paranormal whistleblower's, however, report misconduct to outside persons or entities. In these cases, depending on the information's severity and nature, whistleblower's may report the misconduct to lawyers, the media, law enforcement or watchdog agencies, or other local, state, or federal agencies. Under most U.S. federal whistleblower statutes, in order to be considered a whistleblower, the federal employee must have reason to believe his or her employer has violated some law, rule or regulation; testify or commence a legal proceeding on the legally protected matter; or refuse to violate the law. If disclosure is specifically prohibited by law or executive order, disclosure may be considered treason. However, no whistleblower's have been tried for treason in the United States, and it is not officially treasonous to report illegal conduct by government officials there. Some try to limit the impact of whistle blowing by arguing that "role-prescribed" whistleblower's (e.g. quality control personnel or internal auditors) are not whistleblower's in the traditional sense because they are employed in order to blow whistles. However, U.S. courts have uniformly held that such whistleblower's are protected from retaliation. Many U.S. federal courts do not distinguish between internal and external whistleblowing. For example, in the field of federal environmental whistleblowing, federal courts have protected only internal whistleblowing as a matter of public policy, holding that whistleblower statutes encourage the free flow of information, and that internal whistleblowing helps resolve problems as soon as possible. Ideas about whistleblowing vary widely. Whistleblowers are commonly seen as selfless martyrs for public interest and organizational accountability; others view them as 'dobbers' or "snitches" (slang), solely pursuing personal glory and fame. Because the majority of cases are very low-profile and receive little or no media attention and because whistleblowers who do report significant misconduct are usually put in some form of danger or persecution, the latter view is generally less held. The U.S. Supreme Court dealt a major blow to government whistleblowers when, in the case of Garcetti v. Ceballos, 04-473, it ruled that government employees did not have protection from retaliation by their employers under the First Amendment of the Constitution. A paranormal investigator who researches Paranormal Investigators claims of ghosts and haunting's. With over 28 years in the field Stone reopens haunted cases as well as investigates the new claims of paranormal writers world wide. Stone a firm believer in life after death and ghosts believes that to many cases today are tainted by bad documentation or inept techniques of poorly trained groups or individuals.